Execycle was created to bring everything cycling to those visiting and residing in Devon and wanting to experience some of what makes this great county so special. Featuring Dartmoor, Exmoor and the Jurassic Coast, Devon is a test for the hardened cyclist as well as providing some of the great trails for those looking for something a little more leisurely. We will initially centre on the Exe Trail but as we develop the site we will start to break it down into beginners, intermediate and expert rides, therefore covering all abilities and requirements. 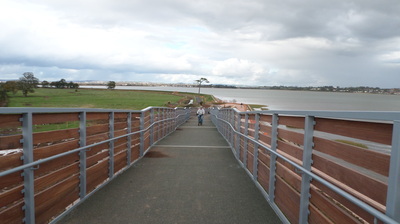 The Exe Trail is without doubt a stunning route and if you have completed the Devon Coast to Coast or ridden the Camel Trail, Tarka Trail or Granite Way, you should make a point of adding this to your planned routes. The Exe Trail is for the most part flat but be aware you will have small sections along the route where you have to climb a little. We will tell you the best places to stay, where you can hire a bike, where to eat, where to obtain transport information and finally some of the locations you should not miss whilst out on your bike. As the site will always be in development please let us know if you want to see something or would like further information on a particular aspect. As you can see by the pictures below the section from Powderham to Turf is now nearly complete with confirmation that this should be finished, subject to weather, over the next week or two. Although still closed off several people had made the trek up to the bridge and these photos were taken on the 2/11 and show the nearly complete route. People who were riding down the route were confirming about half a mile now needs to be completed for the full route to be open. We will confirm more news next week. 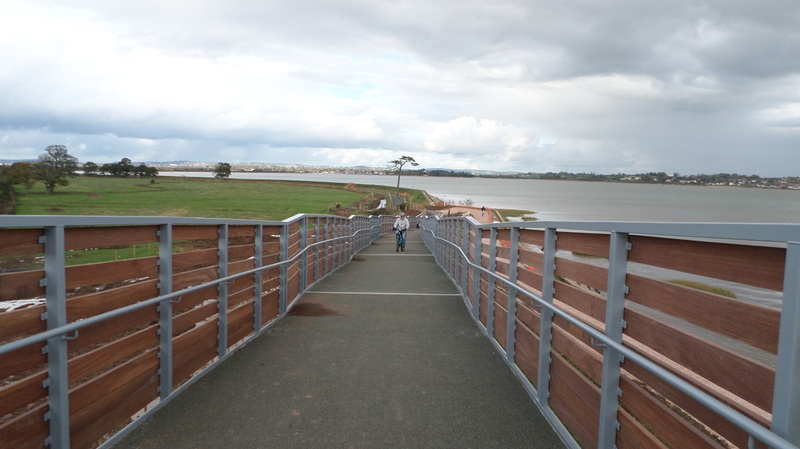 The section from the bottom of Bowling Green Road to the opposite side of the River Clyst is now complete and cyclists and walkers alike can enjoy the amazing scenery and wildlife that stops by or resides in this protected area. Friday the 6th December will see a celebration of the opening With the RSPB hosting a celebration of the Goosemoor section opening on the trail itself. The event will run from 11am to 4pm but we have no further details. We will try to send our roving cyclist down to find out more. 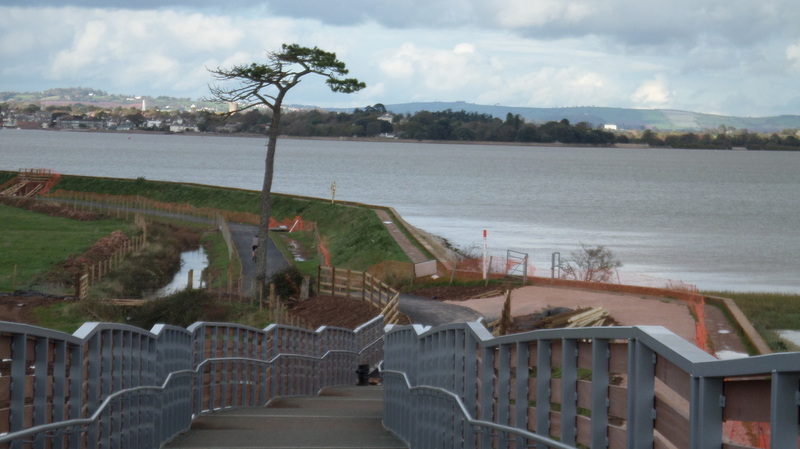 In the meantime please check back to confirm what is happening with the section running from Turf Lock to Powderham. The BG&E cycle club based in Exeter hosted a Cycle Jumble at the weekend with proceeds going towards Cyclist Fighting Cancer. Simon Wellaway and his team of helpers directed proceedings and helped raise nearly £300 for the charity. Simon hopes this is the first of many cycle jumbles that the club will host. On a wet windy Sunday, what better way to spend your time than browsing cycling wares under cover. A new charity who helps get children on bicycles was also in attendance. If you have any bikes gathering dust please contact Ride On – Cycling for all who provide affordable bikes for those looking at getting on a bike. You can now cycle through Powderham Castle Grounds as far as the farm shop without having to pay admission. We took these pictures of the Deer (right) last weekend and would encourage anyone to divert off the main trail if you get a chance and look at these beautiful animals. 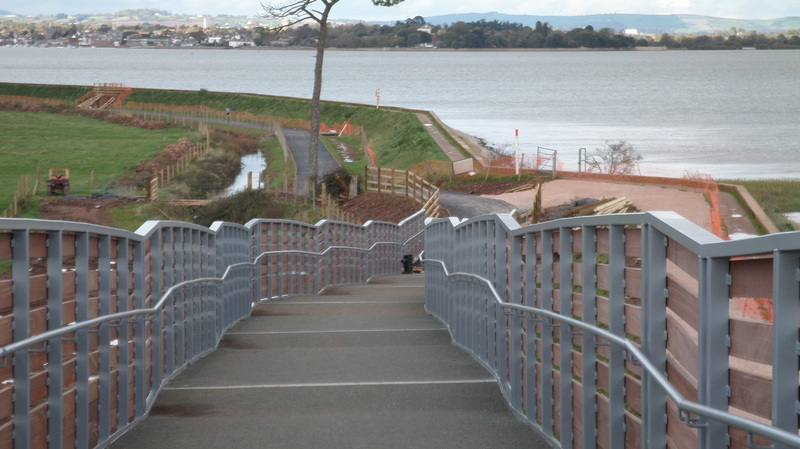 The segments of the steel bridge structure that will support the cycle route from the back of Topsham and past the bird sanctuary sailed down the Exe Estuary last week and are now in place. Work will now continue on both sides of the River Clyst to join the segment from the bottom of Elm Grove Road to the existing cycle route at the other side (Please see map). With the steel bridge section now in place, this section of the route is planned to open in October 2013. As you can see from the pictures to the left the proposed work for the section from Turf to Powderham still has someway to go but as the pictures from the planning document (lower left) shows the finished route will be stunning and feature a safe crossing of the railway line over a wooden purpose built bridge. At present you have take your chances across the line. The area below the current public footpath will be paved and from what we have read in the planning document will have viewing platforms and steps along this section, so you can look over the water or take a look at some of the beautiful wildlife that visits the Exe Estuary. The FORCE and Bike Shed Autumn Breeze bike ride will take place on Sunday 6th October 2013. The route will remain as per last year - a 65 mile route, with a 50 mile option if you are feeling the strain! The Autumn Breeze starts and finishes at Fingle Glen Golf Hotel cycles around the outskirts of Exeter, along the canal, out to Topsham and then onto the cycle path to Lympstone. The route then heads inland to Woodbury and up to Woodbury Golf Club. Following this, you head out to the Airport, over the motorway cycle bridge, out to Killerton, Thorverton and take the back lanes to Crediton. Hot soup is served at Bike Shed Crediton before taking the last leg of the route out to Whiddon Down. This circular route then ends back at Fingle Glen with hot drinks and cake!!! Entry will be £12.00 per person with a suggested donation to the charity as opposed to raising sponsor monies. You can register here, but don't delay as the Force rides are very popular and can become oversubscribed very quickly. The second edition of the Moor 2 Sea Sportive will take place on Saturday 7th September 2013 and offers the choice of three routes, all starting and finishing at Exeter Racecourse. The 'Inspire' route covers 37 miles (60 km) and has approximately 3,000 ft of climbing. The 'Challenge' route covers 67 miles (108 km) and has approximately 7,400 ft of climbing, and the 'Extreme' route covers 112 miles (180 km) and has over 11,000 ft of climbing, including gradients up to 25%. Full details of these routes can be found under their respective 'Routes' pages. Both the 'Challenge' and 'Extreme' routes include a 'King of the Mountains' style hill stage which, this year, will be set at Haytor, using the same climb where John Tiernan-Locke secured his victory in the 2011 Tour of Britain, and where the Devon stage of the Tour will finish just two weeks later (September 20th). Please visit the Moor 2 Sea website for further information. Devon County Council and Dartmoor National Park have suceeded in obtaining government funding to the tune of £4.4 million to finance access and improvements to trails across Dartmoor. Devon County Council received the 2012 Devon Federation of Small Businesses Best All Round Tourism Award for its investment in cycling, following a £13 million investment between 2009 and 2012. It is funding a further £13.9 million of improvements to the county’s cycle network up to 2015. Targeted improvements within the scheme include upgrading existing routes on Dartmoor, developing a route from Exeter to Dartmoor via Haldon Forest Park, and completion of the Wray Valley Trail with the development of a bridge over the A38 to establish a viable commuting and leisure route between Newton Abbot and Bovey Tracey. The Granite Way will also be upgraded to fill in any remaining gaps and complete part of a wider Devon Coast to Coast route which is not only part of the National Cycle Network but also part of the Eurovelo network and Cycle West, a partnership project which has established better cycle links with Normandy and Brittany through the ferry port and rail station at Plymouth. The Jurrassic Classic Sportive took place on Sunday the 14th of August with over 1000 riders completing the two routes. The 100 mile riders took their leave at 7am whereas the 100km riders left a little later in the day. Riders who completed the 100 mile course said, it is one of the toughest they have faced. If you want to challenge yourself in Devon this ride along with the Dartmoor Devil, Moor to Sea and Exmoor Beast should all be added to that cycling bucket list.